Sir Moir Lockhead. Picture by Jim Irvine. Businessman Sir Moir Lockhead and sculptor Andy Scott have become the latest winners of the Wallace Awards from the American Scottish Foundation. The duo will receive their honours in New York on November 9 at an event which will also see the organisation provide a grant towards a £2 million appeal by Aberdeen University and the ARCHIE Foundation. This has been launched to provide cutting-edge neonatal facilities for babies born sick or prematurely at the Baird Family Hospital in Aberdeen. The ASF, which was established in 1956 by Lord Malcolm Douglas Hamilton, is an international not-for-profit organisation, whose aim is to establish links and strengthen ties between Scotland and the United States. 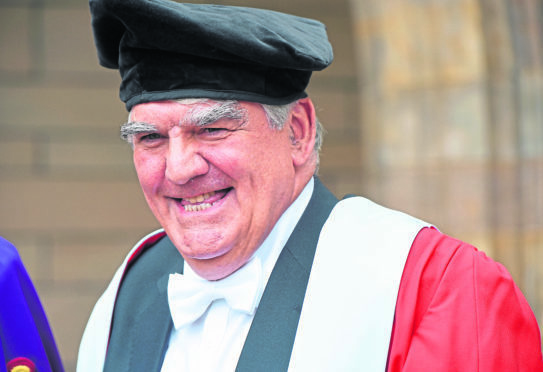 Based in Aberdeen, he created transport company FirstGroup, which was floated on the Stock Exchange in 1994 and was senior governor of the court of Aberdeen University and a former chairman of Scottish Rugby. Mr Scott has been acclaimed for his “outstanding contribution to Scottish art”, which includes the construction of The Kelpies in Falkirk; two equine statues which have been visited by more than 3.5m people in the last five years. More recently, he also produced the striking Poised sculpture of a leopard at Marischal Square in Aberdeen and has been involved in a variety of international projects as far afield as America and Australia. Mr Scott said last night: “I am absolutely thrilled to be recognized by the ASF. “I feel truly honoured that my efforts have been recognised by the Scottish diaspora in the great city of New York and I am really looking forward to being at the event in November. Previous recipients of the Wallace Award include Aberdeen businessman Sir Ian Wood, Scottish historian Tom Devine, and actor Sir Sean Connery.